I taught in Boston for the spring semester and commuted from New York City on the shuttle. The university discount applied only to the lower-rent US Airways version, which meant that the free in-flight reading material was somewhat limited, and as a result I was stuck with The Wall Street Journal and The New Criterion. Why the right is more inclined than the left to gratis distribution to this particular commuter demographic is a mystery, but I dutifully took my trips on wings of freebie reaction. The New Criterion published two articles about architecture during the term; curiously, both were about museums designed by the Italian architect Renzo Piano: the Fogg Museum in Cambridge, Massachusetts, and the new Whitney Museum of American Art in New York City’s meatpacking district. Previously, the journal had enthusiastically supported Piano, covering his “splendid” modifications to New York’s Morgan Library in 2006 and his “masterpiece” addition to Fort Worth’s Kimbell Art Museum in 2014. But something has changed. The review by Peter Pennoyer, a New York architect practicing in the “classical” manner, of Piano’s upgrade and expansion of the Fogg is chilly. Focused on the suture of modernity and “tradition,” Pennoyer—bemoaning “exquisitely detailed stone aedicule balconies” threatened by the proximity of a new wheelchair ramp—overvalues the tepid 1927 building, itself much of a muchness with other Georgian-oid construction from Harvard’s Roaring ’20s boom. To his credit, Pennoyer also decries another ramp, this time on the back side of the building—a wretched and trivializing extension of the great bifurcating distributor of the Carpenter Center, Le Corbusier’s masterpiece next door. And he nails many of the Fogg’s deficits, from its graceless facades and crude negotiation of the old/new seam to its indifferent finishes and tepid circulation (although calling the main stair “anti-humanist” is over the top; “too narrow” would do). He also rightly points out that the most habitable new space in the building is the conservation area under its huge glass roof, a spacious working environment with killer views, far more “functional” than the rather dour new galleries. Tarring the whole by praising the incidental success of some use ancillary to the actual display of art (the staff quarters, the views, the café, the comfy sofas) is a critical strategy that recurs in almost every piece written about the Whitney, including one by New Criterion executive editor James Panero. His animus is freer-floating than Pennoyer’s, perhaps because there’s no literal victim to be defended. In lieu, he idealizes “the museum” as a place of “elevated design,” one that embodies “coherence, symmetry, and a sensitivity to materials.” The Whitney thus fails on two counts: as a flunky within a Platonic category, and also by falling outside it. It’s a building of a completely different type. Whatever “this construction resembled…it clearly did not look like a museum…hospitals, prisons, cement plants, Fukushima, and Eastern bloc governmental agencies all come to mind.” Although Panero lands a few commonplace blows about the behavior of the building, his architectural argument relies almost entirely on whimsical simile: The Whitney can’t be a decent museum because it looks like something else. While this is odious, architectural criticism must account for the full range of a building’s affect and effects: social, functional, aesthetic, and contextual. Provenance matters. But Panero’s piece—with its defense of “elevated design”—is clearly also meant as riposte to the functionalist aesthetics that have dominated virtually all of the building’s critical coverage to date. The New Criterion’s flatulence over symmetry and coherence is not simply neocon nostalgia for the eternal verities; it reflects a more general impoverishment of critical interpretation. Critics of the Whitney have made this problem particularly clear by their tendency to heap praise on the galleries while expressing indifference or hostility toward the building as a whole—a schizy split often reflecting a division of editorial labor in which the art critic cheers how great the art looks and then hands off to an architecture critic to trash the structure that houses them. This focus on the mismatch between inside and out is ubiquitous. 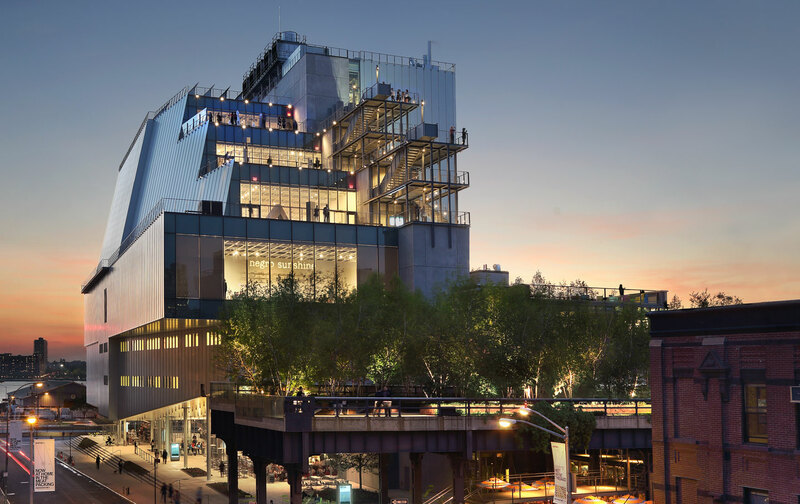 Holland Carter divvies it thus in The New York Times: “From the outside, Renzo Piano’s new Whitney Museum of American Art, set beside the Hudson River, has the bulk of an oil tanker’s hull. Inside is entirely different.” Pete Wells’s review in the same paper of Untitled, the Danny Meyer restaurant on the ground floor, repeats the trope of the marginal building as container for marvelous art: “All the energy and beauty…are on the plates.” In her Times piece, Roberta Smith loves the inside, asserting that the building “accommodate[s] art and people with equal finesse…. Art looks better here, to my eyes, than it did in the old Whitney, and it is amazingly comfortable to be in.” Back on the sidewalk, though, Smith writes that “the outdoor staircase epitomizes the operative and symbolic logic of Mr. Piano’s design,” calling it “the most aggressive part of the multiple components that make the building a kind of architectural assemblage. From the street, the switchback juts over the building’s east face like a fire escape on steroids or a fragment from an aircraft carrier.” This seems a pretty unbalanced idea of assemblage and the elusive compound wholes it seeks; instead she sees—perhaps because it’s architecture—something put together with the wrong parts and assembled into the wrong thing. Virtually all the criticism I’ve read sees the Whitney’s social effects either in this sort of passing parsing of patronage or as the consummation of the gentrification of the meatpacking district and Chelsea, on par with the High Line, for which it provides a literal culmination. Barry Schwabsky, writing in this magazine [“Inside Out,” May 25, 2015], riffs on a 1971 Hans Haacke documentary takedown of a slumlord included in the show and discusses the gentrification of his old neighborhood on the Lower East Side. Peter Schjeldahl concludes his New Yorker review by observing that the museum will quash the chances of any “young artists, writers, and other creative types” to live anywhere nearby. Holland Cotter, too, invokes this eliminationist trope, describing Chelsea as “the precise opposite” of an artists’ neighborhood: “a gated community.” And, for good measure, he mentions that there’s only one Native American included in the show. But let’s get back to Roberta Smith’s aircraft carrier. I found it surprising that no critic has mentioned the gigantic example 35 blocks upriver: the USS Intrepid. Closest was Robert Bevan in The Architectural Review, who (while also comparing the building to a “swish hos­pital”—what’s up with the hospital thing?) writes that “the model is not, as some have said, the post-industrial loft or even the white cube but the aircraft hangar.” Indeed, the Intrepid does have a vast, column-free hangar deck (with the capacity of many Whitneys) and also harbors, on the flight-deck “terrace” above it, a brace of aircraft that we assimilate, in their inoperability, as functionalist “sculpture” of tremendous refinement and even beauty. The Intrepid is thus a genuinely floating object that can unmix the prolix critical/nautical metaphors directly. After three decades in service, the ship’s many appurtenances—gun emplacements, conning towers, radars, antennas, elevators, stairs, and much else—encrust the smooth symmetries of its hull. While seemingly added (assembled) at random, these features have been rigorously calculated not to disturb the ship’s balance, thereby offering us a genuinely functionalist working method and a resulting visuality (also always tested by its operational effi­ciency) that is, by definition, completely succinct. The problem with the compositional reading of functionalism is that it’s completely at odds with functionalism’s nominal aesthetic—with “form follows function,” to coin a phrase: the idea that the succinct, economical accommodation of some set of literal operations is the ground on which appearance is constructed, understood, and judged. By these lights, a diesel engine, a band saw, or an assembly line couldn’t care less about harmony, proportion, rhythm, coherence, symmetry, or any similar valorizing criterion drawn from the other arts—say music or poetry or old-master painting. In fact, few functionalist architects, proudly declaiming their inspiration by non-architecture, have had the courage of this particular conviction. “Functionalist” architecture has been dominated not so much by a genuine machine “aesthetic” but, on the one hand, by the minimalism of the undecorated and repetitive mass-produced building block, imprisoning some robotic fantasy of subjectivity degree zero; and, on the other, by the forms of a very specific category of machines—aircraft, ships, and automobiles, devices in which there’s a premium on the smooth curvatures of hydro- or aerodynamic streamlining. Criticism that insists the Whitney cannot be described sui generis, that the only way in is by comparison to either another kind of building or another kind of object, ends up treating buildings as sculpture, as form stripped of any actual function save to be looked at. The true high-water mark in Whitney crit has to be Ingrid Rowland’s shipwreck in The New York Review of Books, which completely drowns in nautical-metaphorical overdetermination. “Piano himself has repeatedly described the Whitney project as a ship. A native of Genoa, the hometown of Christopher Columbus, he knows a thing or two about navigation; thus his latest structure’s similarities to a seagoing vessel are neither casual or superficial.” Rowland doesn’t actually specify why this is the case, save to suggest that “the building, like a ship, is made of a steel frame, sheathed in steel panels,” which, of course, also makes the building a lot like… a building. In the more directly mimetic realm, however, she’s more precise: “approaching from its east side…it looks like a cruise ship.” But “from the harbor side…the museum reads as a container ship piled high with the portable freight units, dazzling in their simplicity, that have transformed international shipping.” She reminds us too—with weird redemptive imputation—that “the Titanic was to have moored just a few blocks to the north (and along this much altered riverside my family and I boarded an ocean liner bound for Naples in 1962).” The metaphor pitches as it burgeons. Rowland writes that the building “was designed from the inside out”—precisely not how a ship is designed—and claims that “the interiors make more sense as isolated individual units than as an exterior shell that sometimes looks as stern and irregular as the upper parts of a battleship—for the Whitney Museum is a bit of a seagoing destroyer as well.” Cruise liner, container ship, battleship, seagoing destroyer: I’m swamped.